At Nitrotek, we are always looking for ways to improve the features and performance of our models without adding to the cost! They combine light weight, simple design and huge performance with the latest in 2.4ghz radio technology and are sure to bring a smile to all drivers both young and young at heart! We had some interesting entries last month featuring tanks, radio controlled planes, a buggy, the FS Monster Truck and our ever popular XSTR. The winning entry for April comes from Toby Abram who sent us a video of his XSTR rc buggy, though we certainly don’t recommend driving your buggy straight into kerbs at high speed, this video does show both the speed and the resiliance of this model, and why it is so popular. Of course if you do cause crash damage you can order a full range of spares from our website to get your buggy running again! So congratualtions Toby, you have won £100 worth of Nitrotek credit, and here for everyone to see is your XSTR putting up with some high impact usage. If you fancy owning an XSTR then you can order from our web site by clicking here as you can see it’s a great looking buggy and yours for just £89.99 including UK mainland next day delivery! Another video we received last month featured our Dynam Extra 330 performing some amazing aerobatics, unfortunately the maker of this video didn’t enter their details so I’m unable to credit them for it. This video shows just what can be done with this rc plane which costs under £120 with everything you need (other than 8AA batteries for the transmitter) to get it airborne! If you’d like to have a go with one of these then click here to visit our website. Anyway sit back and enjoy this video. So let’s see your May entries coming in, we’d love to see some rc helicopter videos, and more tanks. Edit them, put them to music, roll the credits and get them uploaded. There’s £100 of Nitrotek credit up for grabs each and every month, so what are you waiting for!? Congratulations to Chris Neff from Nitrotek for coming 3rd out of 157 drivers at last weeks British Touring Car Championships. The newly resurfaced West London track was the venue and with the weather being very kind to us again in the UK it was a cracking weekend’s racing. Chris is one of the guys who you get to speak to when you ring our support line, and he’s been a member of the support team along with Christian, Mick, Simon and Thomas since August last year. A very keen racer of electric rc cars, Chris attends many national and regional events throughout the year. Pictured right are the three winners, with Chris Neff on the right. We announced last month that we are proud to be bringing the GS Racing range back to the UK, as promised here’s a further update. We’re planning to start shipping these high quality models at the end of June so only a couple of months off; prices, and pre-order availability will be announced on this blog very soon. These are the models you can win national competitons with, last year a GS model won the Brazillian Nationals and only recently Georg Horninger came 3rd in the Austrian National Championships with his GS Racing buggy. If you want to know what to expect, have a look at this video of the GS Racing Conqueror, which is the Nitro powered Pajero replica. Why not subscribe to our blog so that you get an email as soon as we post more news! We at Nitrotek are so excited to be able to tell you that very shortly we will be bringing the respected GS Racing range of rc cars, trucks, buggies and truggies back to the UK! These models combine fantastic looks, brushless or nitro powered propulsion, outstanding build quality and as you’ve come to expect from Nitrotek – amazing value for money. Not only this but the range includes yet more licenced shells including Subaru, Citroen, BMW, Mitsubishi and also some striking buggy and truggy designs. For those into their 4x4s, then this radio controlled Mitsubishi Pajero/Shogun (left) will give you the opportunity to stage your own stages of the Paris-Dakkar wherever you like! A faithful reproduction of these specially prepared 4WD beasts, this model stands out from the crowd as something extra special, or is that extra-ordinary!? This Mitsubishi is nitro powered with a rear mounted exhaust and features the renowned Team Infinity nitro engine. See picture below for chassis layout. If on road, touring cars and rally cars are more your thing then look no further than this stunning looking BMW, equipped with 2.4G radio gear this is another nitro powered beast, with low centre of gravity, giving awesome grip even at high speed. Also available with a Subaru Imprezza Shell and a Citroen Xsara – there’s something to suit all tastes. As with all GS Racing models these touring cars are superbly finished on the outside and precsion engineered on the inside; attention to detail is second to none. These models are also fitted with the Team Infinity engines, that you know and trust. Maybe electric is more your thing, not everyone is a petrol or nitro head afterall; well you are catered for by these models too. The model shown left is the familiar buggy shape, with large offroad tyres, high downforce wing and an extremely powerful li-po, brushless motor and brushless ESC combo. These models will not disappoint – they look great and are faster than you will believe! Take a look at the picture below showing the chassis layout and note the cable management, the carefully thought out layout – giving you plenty of room to get in for maintenance purposes. I think you’ll agree these models are in a class of their own and are suitable for the hobbyist and serious racer alike. Keep an eye on our twitter and our Facebook Fan Page for more information, updates on when these models will be arriving, and news of any pre-order offers. Check out this rc truck – the Barbarian EXL – it’s a massive, and extremely powerful radio controlled monster truck. This EXL is a fully built, fully featured, top of the range 1/8 scale off-road monster truck, and comes with many feature enhancements to make this a superb electric brushless motor powered model. This is the Pro version and it is fitted with high quality components – is 4WD and equipped with a powerful brushless motor which gives this monster phenomenal acceleration! This model is the pinnacle of the brushless monster truck range! Its shiny chrome wheels just finish off the well engineered look of this model. Also you get a choice of colour for the beautifully finished shells – red or blue. The Barbarian EXL is built using advanced components and innovative engineering to get the best performance out of your package. It has a newly developed C-hub steering system, where the king pin axis extends to the wheel centre; this feature improves steering performance. It has a specially designed suspension system, with twin adjustable rear suspension modes which allows for a flexible driving mode and a smooth driving mode. The Barbarian EXL is built around a narrow, but solid aluminum chassis; this centralised chassis design allows quicker steering and faster response. 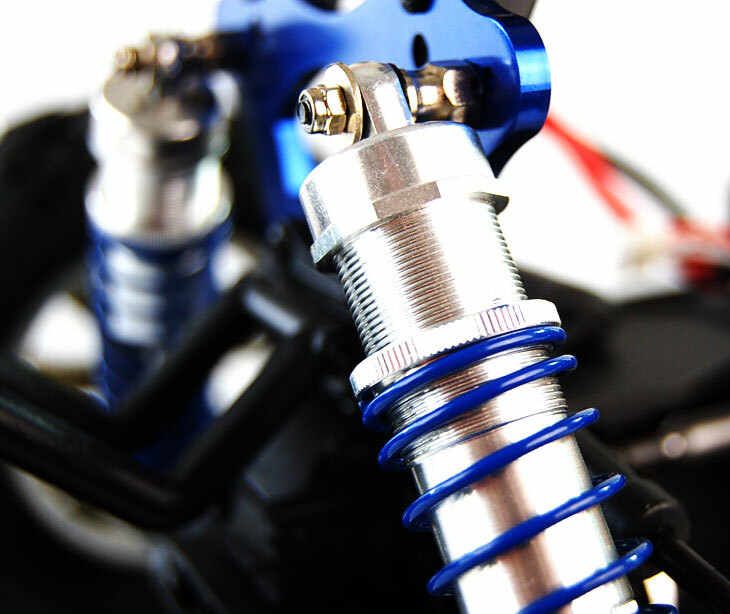 The blows are cushioned by the 16mm super big bore oil shocks, see pictures. It also has fully adjustable sway bar ball cups, for customisable and better traction and stability, depending on whether you’re speeding across tarmac or roughing it over gravel and tougher terrain. Additionally the front bumper is built so that it moves backwards on impact, this can prevent the chassis from becoming distorted or even broken when landing after jumps. All the linkages can be set with adjustable turnbuckle. Due to the amount of power this combination of battery, ESC and motor can deliver, the Barbarian EXL features two cooling fans – one for the motor, one for the ESC. This is no small model, the Barbarian is a beast – 570mm long and with a massive 50mm of ground clearance – on top of this it is almost as wide as it is long! You’ll be able to drive this almost everywhere – tarmac, gravel, on-road, off-road – the choice is yours. Order yours now – for only £299.99 including next day UK mainland delivery. Click here and BUY! The December prize of £100 in Nitrotek credit goes to Josh Thornley for his video of the electric short course truck, the Acme Trooper. The video shows the truck jumping and flipping and surviving some pretty hard landings! Thanks Josh for the video and we hope to see more from you. The first video winner of 2011 comes from Craig Hollis who’s used a mixture of stills and video to create this demonstration of our ShengQi 1/5th Scale Petrol Hummer monster truck. All done to the sound track of AC/DC’s Highway to Hell. Craig too wins £100 in Nitrotek credit. So who’s going to win February’s prize, there have already been some outstanding February entries, so the bar is high for this month’s prize. Let’s just say the competition is HOT! There’s still a week to go, so put your video editing, your driving and your imagination to the test and get those videos submitted for your chance to win £100 worth of credit to spend on our models and spares. To submit your video go to the page on our website for your model and click the upload video link, at the moment the youtube link is not working but you can still upload the file from your hard drive, so don’t delay, get them uploaded this weekend! November’s winning video comes courtesy of Andrew McCombie who filmed his FS Racing buggy in a few different locations. Taking off on a ramp, and speeding across tarmac, showing how quickly the buggy accelerates, even in quite small spaces. It also shows that the FS Buggy is quite resilient even after a hard landing, though don’t forget, we do have a complete range of spares should you have a bad landing with yours! We’ve already had some great entries for December, but there’s still plenty of time to upload yours for the chance to win £100 worth of credit at www.nitrotek.co.uk so get submitting! Radio Controlled Stocking Fillers and Toys – now in stock!!! Nitrotek have got some really great Christmas goodies in stock now at amazing prices. Lets have a look at a few – you can click the image to go straight to the product page on our website. At only 23cm in length this fully functional rc helicopter is a mini marvel, it has 3 channels so can fly left, right, up, down and hover. It is realistically styled and very light so that it can be flown indoors safely. It is gyroscopically controlled for stable flight and even n beginner should pick up the basics in a matter of minutes then with a bit of practice, you’ll have mastered its controls and will have it buzzing around. It charges in about 30 mins and this will give you around 10 minutes of flying time. These new models are incredibly priced, for example the radio controlled helicopter above can be yours for only £39.99 inc next day delivery! The brand new ready to run 1/16th scale electric Super Cyclone RC speed boat brings speed and excitement on the water as it twists and turns. This fully loaded electric Cyclone boat is constructed from an ABS plastic hull, and is finished to be one of the most detailed and realistic rc boats on the market. The high performance 380 motor will blast the Cyclone out of the water at 15+ mph and all is controlled by a micro servo with 9.6v battery and charger. Again, this fantastic looking radio controlled boat is available for just £39.99, all you’ll need is 8 AA batteries for the transmitter and you’re off! The BMW Z4 is a rear-wheel drive sports car by the German car maker BMW. It follows a line of past BMW roadsters such as the BMW Z1, BMW 507, BMW Z8, and the BMW Z3. Anyone would love to get their hands on the real deal. So why not have the car of your dreams, but in a smaller form! Simple controls and stunning looks make this coupe sports car amazing value for money, I think the pictures speak for themselves – you will not find a better looking BMW than this anywhere! The BMW Z4 Radio Controlled Car, 1:12 Scale, is an ideal gift/present for any age. And guess what? Yes – it’s available for only £39.99!! Nitrotek have got some really great Christmas goodies on their way, and the good news is that you can preorder them right now and save £5 on the RRP. These models are already fantastically priced anyway. Lets have a look at a few – you can click the image to go straight to the product page on our website. These new models are incredibly priced, for example the radio controlled helicopter above can be yours for only £34.99 inc next day delivery if you catch it on preorder! The high performance 380 motor will blast the Cyclone out of the water at 15+ mph and all is controlled by a micro servo with 9.6v battery and charger. Again, this fantastic looking radio controlled boat is available for just £34.99 on preorder, all you’ll need is 8 AA batteries for the transmitter and you’re off! And guess what? Yes – it’s available on preorder at £34.99! !